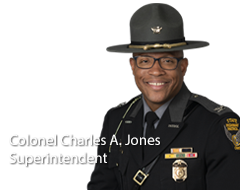 The Ohio State Highway Patrol and The Ohio State University – John Glenn College of Public Affairs will host the 2019 Public Safety Leadership Academy March 25, through June 7, 2019, at the Patrol's Training Academy. Those interested in attending must complete the course application and nomination form by January 4, 2019 and send via email to Tanya Benner at tbenner@dps.ohio.gov. Email Tanya Benner or call (614) 752-4152 for more information. Credit Hours: Students who successfully complete the program will receive 10 semester hours of academic credit through the Ohio State University – John Glenn School of Public Affairs. Program Tuition: Email Tanya Benner or call (614) 752-4152 to determine if your agency qualifies for funding. Room and Board: Room and board will be provided at the Ohio State Highway Patrol Training Academy at no cost. Students also may commute if desired. Students who choose not to stay at the Training Academy will be responsible for securing their own lodging and meals. Physical Fitness: Students will participate in the Public Safety Leadership Academy Physical Fitness Program. The program is designed to help students adopt and maintain a healthy lifestyle.